"There's research shows us that a child will have a better concept and better memory for what a letter is and what it represents if they actually handwrite it ... [but] the argument is really against those pages of cursive, joined-up writing exercises which, in the end actually don't change many people's hand writing styles... Cursive writing is cute, and nice, and decorative if you've got a leaning towards wanting to do it ... just like you might like to learn to crochet or knit. "The handwriting exercises that we do are really based on very old technology," she said. "So when we teach kids particular downstrokes and where to start their letters, it's really based on how you had to use the technology of a fountain pen and ink." Cursive writing is a funny thing; it's not quite practical (who writes an essay under exam conditions cursively, and who finds that more legible than neatly separated printed script? ), and it's not quite decorative (it stops well short of anything that could even generously be called “calligraphy”). Its sole raison d'etre is tradition (that teaching children fountain-pen-era techniques is in some ways useful), if not an authoritarian, vaguely punitive disciplinary mindset (idle hands are the devil's plaything, and those little hell-apes that we call children must have their rebellious spirits broken with laborious exercises lest they get up to mischief). Perhaps killing it off as a mandatory part of the curriculum could be the best thing for it: once it's no longer compulsory, and is as alien to the average person as film photography or slide rules, some subset of artisanal crafters and/or hipster contrarians will take it upon themselves to revive this vintage skill and take it further than it would have otherwise gone? The article, on ABC News, speculates on the possibility of Australia following the Finnish lead and removing cursive writing from its schools. I expect that will happen somewhere around the time of them ditching King Charles III as their head of state and abolishing Imperial honours for the second time in history. I can imagine the ultra-conservative establishment running the country wouldn't have a bar of any such proposal, and indeed can almost read the column in The Australian denouncing the very idea as proof that the Marxists have taken over the teaching profession. Recently, I was in Sweden and Finland, catching up with some friends and seeing Loney Dear playing with the Norrbotens Kammarorkester in Lapland (which was amazingly good). At one point, I got invited to a party in the north of Sweden, with the advice that I may want to bring my own beer. Which is what found me in the aisles of the Systembolaget in Luleå. The Systembolaget, for those unfamiliar with this word, is the state-run liquor shop chain in Sweden. The government there has a monopoly on the sale of strong beer and all kinds of spirits, and does so through a chain of shops throughout the country. Only those shops may sell any beer stronger than about 2.5% 3.5% or spirits. This is a cast-in-iron law, with no exceptions, which has some peculiar consequences; for example, air passengers flying from Sweden to anywhere in the EU are unable to buy spirits at the airport shops because tax must be levied on spirits not being exported from the EU, and only the state can do that. Later, when I recounted my Systembolaget experience, and the way it differed from my expectations, to a friend, they mentioned that the staff are also experts in beer and spirits, and able to make knowledgeable recommendations. The implication of this was that, if you live in Sweden and know your way around beer, the government will want to employ you to recommend ales and pilsners to consumers. Now I'm far from a hard Thatcherite or a believer in the Libertarian ideal of the minimal “nightwatchman state”, though, having grown up in an English-speaking world, in which the free-market principles articulated by Milton Friedman are as accepted as Copernican astronomy (even by those who regard themselves as being on The Left; while there, for example, are calls for the renationalisation of Britain's railways, for example, few would call for the Upper Crust franchises to be kicked out of stations and replaced with the return of the much-maligned British Rail sandwich), this strikes me as rather exotic and a little weird. Beer-recommending civil servants? A state liquor monopoly simultaneously discouraging and encouraging drinking? The State not as Orwellian Big Brother but as the older brother you go to to ask about how to enjoy vodka? We truly are no longer in the neoliberal Anglosphere. Almost all the Nordic countries have state liquor monopolies. The exception is Denmark, but the other Scandinavians regard the Danes, with one foot on the mainland, to be halfway towards being the wild, laissez-faire Germans (and yes, that is a stereotype in Scandinavia; while in the English-speaking world, the Germans may be stereotyped (at best) as precise, humorless BMW engineers and/or Kraftwerkian Mensch-Maschinen, in Scandinavia, they're an unruly people who drink in the street and don't tax their beer.) In Iceland, the equivalent monopoly chain is known as Vinbuð, though there was talk a while ago about rolling back or eliminating its monopoly. The Finns are slightly more liberal, in that one can buy beer from ordinary supermarkets, where (as in Australia) it's stored in a segregated section which (as I discovered shortly after disembarking from a Helsinki-bound train at 8:30) is physically closed off at 9pm. For stronger spirits, one has to go to the state liquor shop, which is called, with characteristic Finnish lack of euphemism, Alko. And it's not only the quasi-socialist Jante Law societies of the Nordic world that do this; in the US, the conservatively Mormon, and staunchly Republican, state of Utah also has a state liquor monopoly. I imagine that their shop shelves probably look less enticing than those at the Systembolaget. Scandinavia And The World is a web comic drawn, in anime fan art fashion, by a Danish illustrator, and exploring Scandinavian culture and stereotypes (and, occasionally, the rest of the world). In it, Denmark is never without a beer bottle (the Danes, you see, don't have the punitively high alcohol taxes and state liquour monopolies that are the norm in the Nordic world), Norway is always carrying a fish, Sweden may or may not be gay and Iceland is a bit nuts; with cameo appearances by America (a loud, not-too-bright bigot and his sister, Paris Hilton) and England (who wears a monocle and speaks like a P.G. Wodehouse character and/or Hollywood villain). There are comic strips on topics ranging from mutual stereotypes of the other Scandinavian countries and the differences in the sound of their languages to the gloomy nature of Nordic cinema and the varieties of putrefied fish consumed in the Nordic countries. Well, when it isn't veering off into fits of anime-otaku sexual innuendo. If you've ever wondered why what is commonly called Christianity in the US is so weird; why it so often condemns the poor as being responsible for their own misfortune, defends the right to make a profit above others, and is so obsessed with the evils of homosexuality and abortion, A guy named Brad Hicks wrote an illuminating essay in five parts (1, 2, 3, 4, 5) about how political expediency during the Cold War drove evangelical Christians (until then suspicious of worldly wealth) and the Republican Party (until then, the party of east-coast industrialists, with little time for religious pieties) into each others' arms, creating a Christianity that emphasises condemnation over redemption (though, granted, that's hardly new; Calvinism was there for a few hundred years before, though not quite to the same Randian extent), is not at all uncomfortable with getting filthy rich (as long as one donates to the Republican Party), and whilst not throwing any bones to the not-so-rich, manages to unite them with a common activity everyone can get behind: reinforcing a personal morality based in an idealised view of just-before-one-was-born (nowadays, the upright 1950s, that suburban patriarchial Garden of Eden before the serpent that was The 1960s came along and ruined everything), with a call to war against those who transgress against it (gays, feminists, abortionists and such). The convergence of Christianity and right-wing politics in America has brought its own problems for both, with growing numbers of young Americans turning away from organised religion to avoid the politics. Granted, most of them aren't yet declaring themselves to be atheists (in America, it seems that one has to be pugnatiously anti-religious to feel comfortable using that label), but are filling in their religious orientation as "none". Having been back in Melbourne for three months now, waiting for the album to be reissued, Ninetynine have been rehearsing, writing new material (some of which will be heard on their upcoming dates) and commissioning a series of low-budget videos for album tracks with the simple proviso that the band don't have to appear in them. It's good to hear that they're working on new material. A few items from Music Thing: this account of one hip-hop head's attempt to recreate the talkbox sound à la Roger Troutman, with instructions on how to build your own talbox from an amp, a speaker, a plastic bowl and some plastic tubing. And here is a disco-dancing lesson from a Finnish TV programme, with the instructor showing the moves and then demonstrating them to the sound of Dschingiz Khan's Moskau. Eurovision's in good hands. In Tampere, Finland, an atheist group has set up a website to help people resign from the church. Easy resignation through the web site has increased the rate of resignations in Finland. Resigning through the web site only requires filling a short personal information form, after which a local city council will receive an email about the resignation. In cities where the city council does not accept email resignations, Freethinkers will pay the postal fee. The rate of resignations from the Evangelic Lutheran state church of Finland has increased rapidly in recent years. 27009 people resigned from the church in 2004. 33043 people resigned in 2005, which is 22% more than in 2004. There are approximately 5.26 million people in Finland, which gives a proportion of people resigning from the church of 0.6% in 2005. The most common reasons cited for resigning from the church have been saving church income tax (1.3% on average), lack of religious beliefs and belief in another religion. A person can avoid church income tax by resigning before a new year begins. Increased resignation rates in November and December (shown in the figure) supports the theory that the most common reason for resigning is avoiding the income tax. Finland is officially a Lutheran country, with everyone belonging by default to the state church unless they submit a resignation form. Mind you, one could argue that a universal state church is just another implementation of a secular society; the levels of zeal one can expect from such an organisation make the Church of England look like Branch Davidians by comparison, and many of those who do belong to the church see the inside of one about three times in their lives. 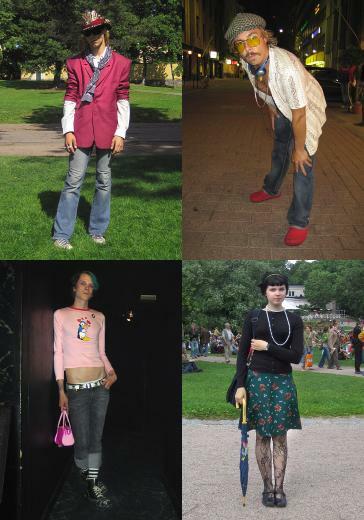 Street fashion in Helsinki, which seems to be a sort of Scandinavian Harajuku. The kids there seem to be quite creative about how they dress. There are a few recognisable archetypes (hair-metallers, punk rockers, the odd goth, a handful of dudes with 'fros and various sorts of coolsies who wouldn't look out of place at Dangerfield on Brunswick St., or, indeed, at an Architecture In Helsinki gig), and then you've got the people who have their own unique thing happening, for better or worse.